Simplex Americas LLC carries an extensive selection of oil in water monitors and analyzers from Rivertrace Engineering. 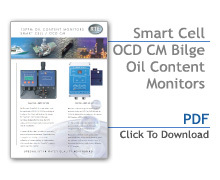 The Smart-Cell Bilge Alarm oil content monitor meets the requirements of MEPC 107 (49) for monitoring of 3 oil types: Fuel Oil, Diesel and Emulsions. By utilizing the Smart- Cell Detector Array Technology, technology developed by Rivertrace Engineering, the Bilge Alarm oil content monitor analyzes all three oil types simultaneously without the need for re-calibration. This oil content monitor contains a manual cell clean device to easily enable routine maintenance. Optical cell fouling is recognized as a leading cause of monitor malfunction or incorrect reading. By simple operation of the manual clean device, the Smart-Cell remains in optimum operating condition. A convenient exchange and return service offered by Simplex Americas for oil content monitors gives operators the opportunity to ensure compliance at all times. 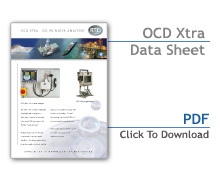 For precision and reliability, new-generation second-to-none OCD Extra oil-in-water analyzers,are used in water treatment management and process monitoring and in water discharge monitoring situations. These first-rate oil in water analyzers feature multiple-sensor technology and multiple light wavelengths, which allow them to precisely measure oil in the zero-to-200-rpm range in produced water streams. Multi-parameter displays show the pressure, oil content and turbidity of a sample, as well as a graphical average of oil readings from the last four hours. Seven days’ worth of readings are stored and available at all times. The OCD Xtra can be calibrated to analyze the presence of up to 3 different solid types and up to 6 predetermined oil types. Contact Simplex Americas LLC today for more information on the Rivertrace oil content monitor or oil in water analyzers.